I’m done pretending that the handful of racist gay white men out there—and they’re out there, and I think they’re scum—are a bigger problem for African Americans, gay and straight, than the huge numbers of homophobic African Americans are for gay Americans, whatever their color. Notice how Savage mentions gay African Americans once throughout his entire article. Notice how he mentions us only in passing. We’re not the main focus here. No. Properly acknowledging the fact that there are people who are both gay and black would take too much away from the point of his article: which is that black people are homophobic and that gay people (read: white gay people) have it worse. That is the point that was driven across to all the white gay people in his audience who went ahead and left racist comments underneath Savage’s article. Many white LGBT people are guilty of enforcing this “us versus them” mentality, this gay versus black thing. They make statements like “gay is the new black,” they compare whatever hardships they face for being gay, bisexual, or trans to Jim Crow Laws, and they imply or outright state that racism is over and LGBT rights are the next goal to be achieved. All of these things hurt, erase, and alienate black LGBT people. On July 3rd 2016, members of Black Lives Matter Toronto organized a peaceful protest during their city’s Pride celebration. According to an article from the CBC, the Black Lives Matter activists held up the parade for about 30 minutes until the Executive Director of Pride Toronto signed a document agreeing to the group’s demands. Some of the demands were: no more police floats in future parades, a commitment to a permanent stage at pride for an organization called Black Queer Youth, and a commitment to more ASL interpretation provided by black interpreters. 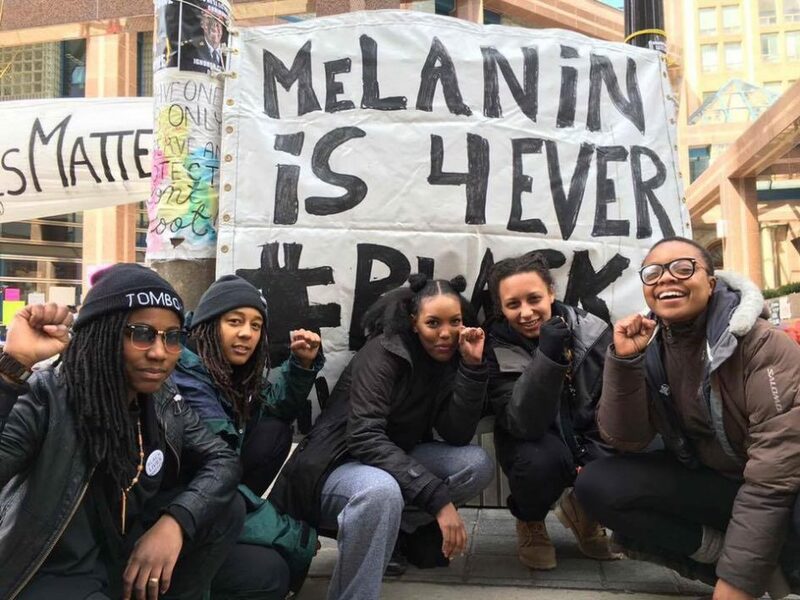 You would think that most people would be happy about what BLM Toronto was able to accomplish, but that wasn’t the case. Some accused them of “attacking” the LGBT community and “hijacking” the parade. A lot of people couldn’t seem to wrap their minds around the fact that most of the members of BLM Toronto who protested at Pride are also, get this, members of the LGBT community. In their minds, it was yet another black versus gay situation. You see, in order to understand a person, you have to be able to see their complexities and engage with that. However, if you’re able to put them in a box and say “you’re just this one thing,” you only have one thing to engage with. SO when Black Lives Matter (a group who has a majority of members who are LGBT-identifying) comes out to protest the anti-blackness of Toronto Pride, you have people shouting ‘this was not your space to do this’. Where else, but the Pride parade would be a better place for black LGBT people to protest the erasure of black and racialized bodies? As a black lesbian, i’m literally expected to throw away one identity for the other. Sorry, but not everyone has that luxury. BLM Toronto led the trans march, the dyke march, and the parade and on ALL three days halted the parade and held a sit-in and moment of silence for our fam that we lost in Orlando. On the third day however, we sat-in and refused to go on until people start actually giving us space when we’re alive and stop waiting for us to die first. 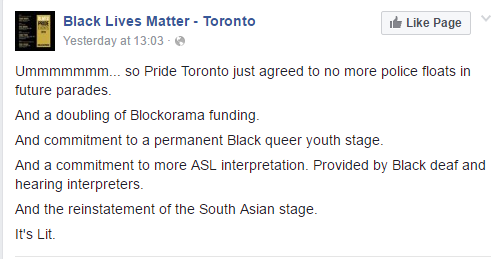 Pride Toronto has constantly cut from the Blockorama and BQY (Black Queer Youth)stages which are stages led by Black organizations and attended mostly by LGBT people of color. More black ASL interpreters are needed at these stages. As a black lesbian, these are the only stages my whole self feels validated in. The South Asian stage was cut out this year. Police, who continue to brutalize racialized communities in and out of the LGBT community get to have a float in uniform, which makes so many of us feel unsafe. These issues are what BLMTO sat in for 25 minutes to protest and demand changes towards. Are the issues affecting the minorities and the racialized members of the LGBT community really less important than the illusion of inclusivity and the spectacle of happy people at pride? What is pride now that the political is being sucked out of it and what is there to be proud of? Don’t stop speaking out. You are doing the good work.